“I'm honored to be elected as the next Judge of Williamson County. For the 103,567 people that voted for me, I want to say 'Thank You' for the confidence you have placed in me with your vote. If you are a Republican, Democrat or Independent, I will strive to lead our county in a way that will honor you. God Bless Williamson County. 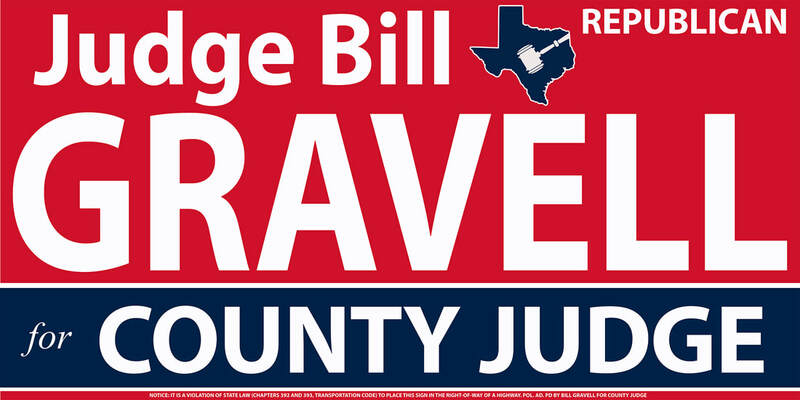 As your County Judge-elect, I will fight to ensure Williamson County never becomes a sanctuary county and we will never provide taxpayer dollars or protection to those who are in our country illegally. ADVOCATENEWSTX.COM, MARCH 7, 2018—The 2018 Republican primary is finally in our rear-view mirror, and we are pleased to report the results of race results available at post time. 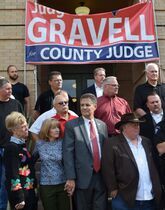 For the County’s top race, Judge Bill Gravell is one step closer to changing his job, although not his honorable title. With 116 precincts reporting, he is the winner with 52.39%. Bill was appointed Justice of the Peace, Pct 3 in 2013 and has had great success as a leader and compassionate judge. He is a strong adherent to things good and just; God, family and Williamson County among them. He is a lifelong resident of Williamson County and is committed to protecting its citizens—from the youngest at-risk child to the most senior military veteran. He is also dedicated to wholesale reform of the property tax/appraisal system to champion the needs of everyone in between.